I’m so glad you enjoyed Monday’s unicorn post. The irony is that this week in particular has been maaaaaadly busy with TRISM prep and training. I haven’t formally introduced it yet, but TRISM is a fast casual eatery, bar and event space opening on Ohio State’s campus. The menu is heavily inspired by Alchemy but will also have an entirely new line of worldly-inspired meal bowls next month. We’re having a soft opening this coming Monday so it’s all hands on deck. Exciting times! I thought it would be fun today to give you some background on how I’ve been spending my days preparing for the open, so lettuce begin! Jeff just started a new job and we haven’t been getting much sleep lately…mostly late nights and early mornings for us both! I woke up around 6:15am pretty tired but fully aware that I wouldn’t be able to fall back asleep. Since it was so nice out, I decided to do something I NEVER do in the morning…read! I got ready and headed to Fox in the Snow around 7:30am to get a few pages in of You Are a Badass. Although I got a little distracted with social media and texts, it was still so lovely to spend the morning on a patio sipping coffee with a book in my hand. 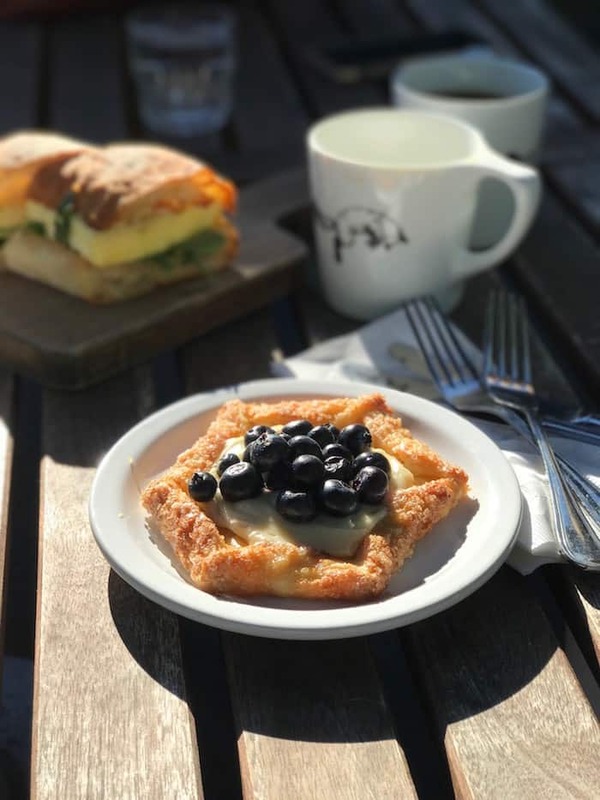 I had a birthday breakfast with my friend Lauren at 8:30 which involved more coffee, the best egg sandwich ever, and the cutest blueberry lemon galette. After breakfast I headed to Alchemy to check in. I taste-tested some new juice, chatted with the staff, talked to the company’s marketing manager about TRISM menus, and responded to emails from distributors about items we still need. 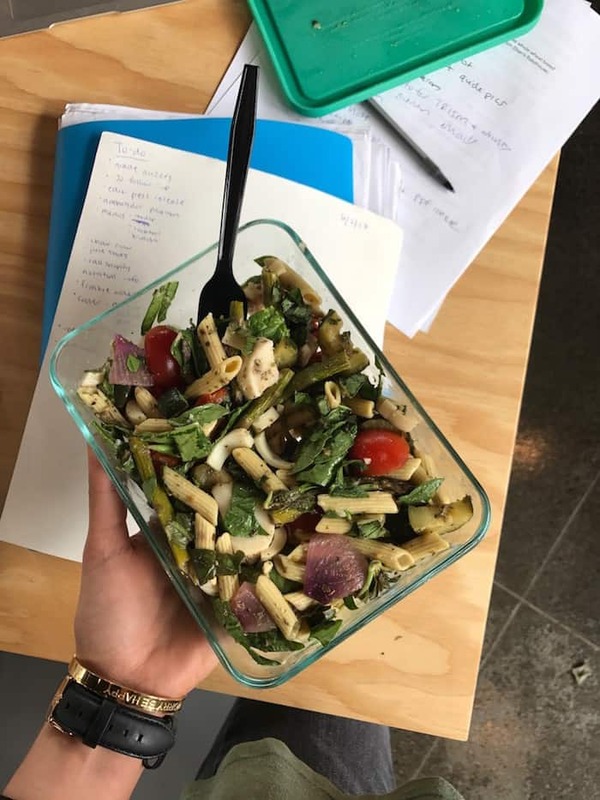 Lunch was a super delish lentil pasta salad with roasted veggies, spinach, basil, and hearts of palm (similar to this Healthy Pasta Salad). I’ll be posting the recipe soon! Then I headed to TRISM for another round of staff training. 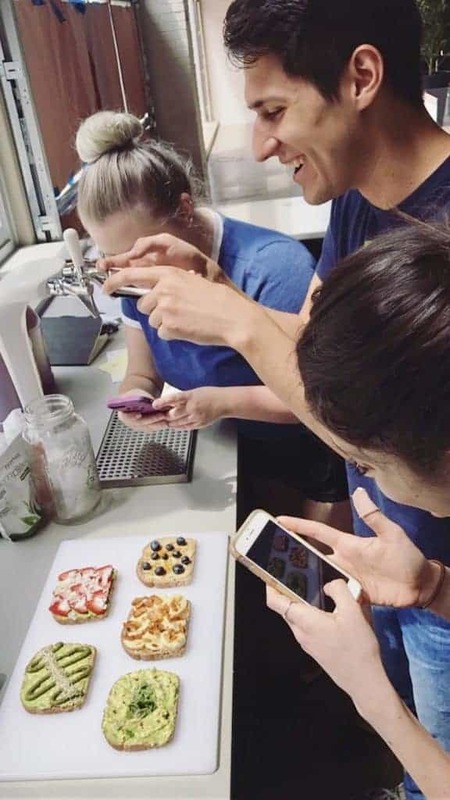 We worked with the newbies as they made a million and five smoothies, bowls, and toasts before going over the concept again in detail, handing out quizzes, and the like. I had to sample every toast, of course! The Baconana toast with almond butter, coconut bacon, banana, mesquite smoked sea salt, and maple syrup is my absolute favorite new menu item. Sweet, salty perfection! It feels so damn good to dive back into menu development again and to have the opportunity to bring such awesome, wholesome eats to my alma mater. Then we had a company meeting with all the chefs to talk about sourcing and pricing. I love me some negotiation! After the sourcing discussion I had a blueberry RX bar and some strawberries before sitting down with TRISM’s chefs to talk about tying up loose ends, which was everything from determining pars for bread and acai to cocktail prep and scheduling. PSA: The ripped jeans I’m wearing are my favorite pair ever and they’re 50% off right now! And thennnnnn I had to go to the body shop to get my passenger side view mirror replaced because let’s just say I’m not the world’s best driver! Eeeeek. I had planned on going to Body Pump at 6pm but I’ve been so dead tired at the end of the day lately from all the standing and talking. I try my best to be intuitive with working out like I am with eating and I don’t force it when my body isn’t feeling it. I haven’t worked out since Saturday morning but you won’t find any judgement here! Three or four times at the gym each week has been best these days. I’m starting to learn that if I don’t do it in the morning, it’s probably not gonna happen. Sacrificing sleep to go to the gym is a big no-no for me! Dinner was my favorite dinner on the planet, tacos with chickpea pecan filling! 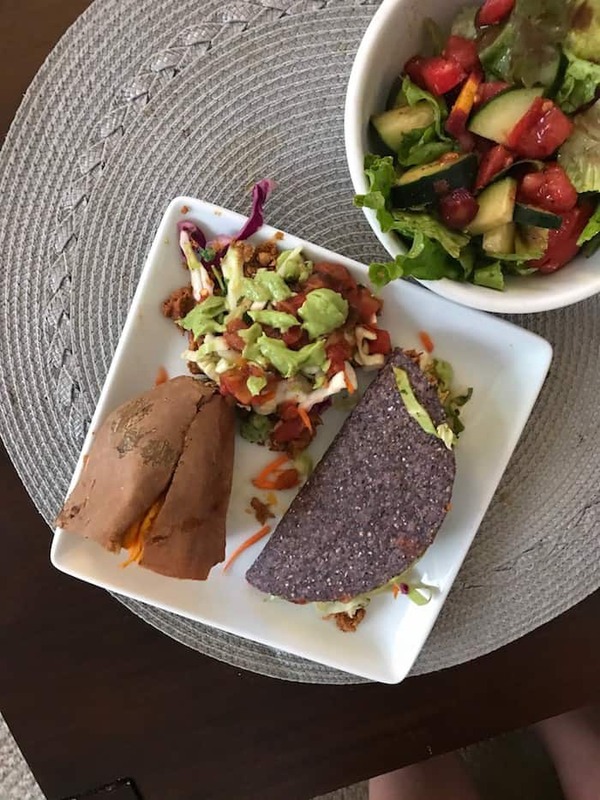 I did half blue corn taco shells and half sweet potato (which I later slathered with almond butter and sea salt). Salad on the side, per usual. 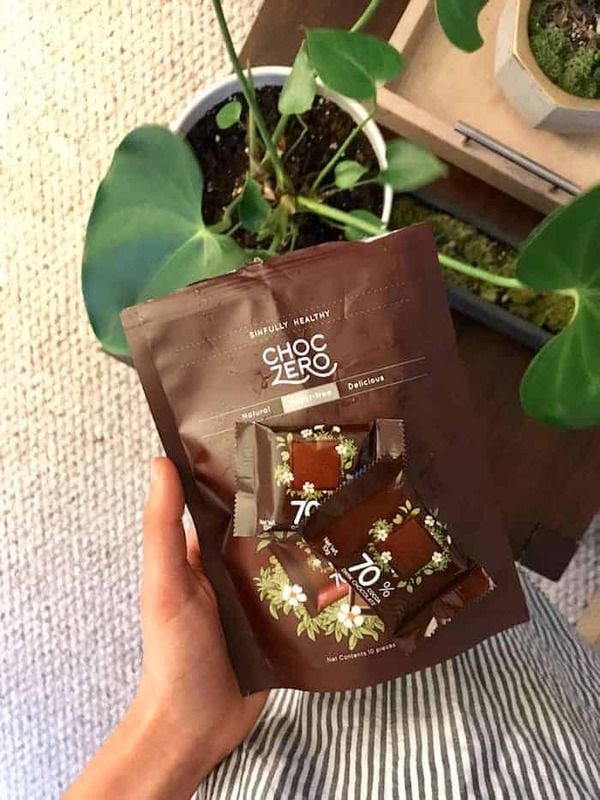 I got a bunch of ChocZero samples in the mail that I noshed on a couple 70% dark chocolate squares for dessert. They’re sweetened with monk fruit instead of sugar and was quite delightful! I have a slight night-gown obsession (Jeff calls them sleep dresses, LOL) and this striped one from Target is so adorable! Love the toasts you sampled! They’re so Instagrammable! 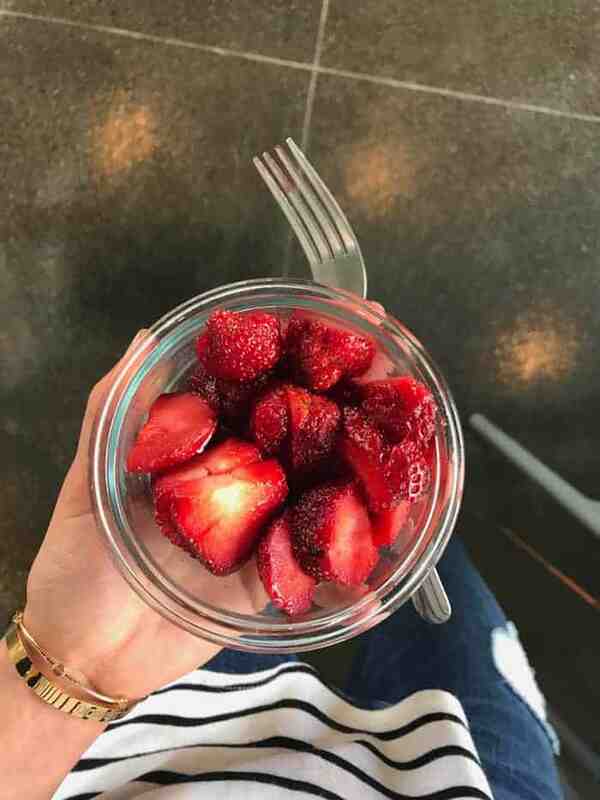 Another delicious day! And I love the world of toasts, so many awesome combos for any meal of the day. The Baconana toast sounds out of this world! Trism sounds amazing!! Congratulations on all your hard work! I wish we had something like Trism in college ?? I absolutely love how much thought you put into menu development! It is so freshing to know that there are restaurant and food serving companies that focus on quality products and delicious wholesome food! I wish I could come sample everything at TRISM. Best of luck with the opening! I really appreciate how you are so open about your busy lifestyle and how you work in intuitive eating and exercise. I work and am in school and I feel like so many bloggers are kind of out of touch with what it means to not work at home and actually have a lot of demands that aren’t flexible. I can’t go to the gym for two hours or cook complicated meals. 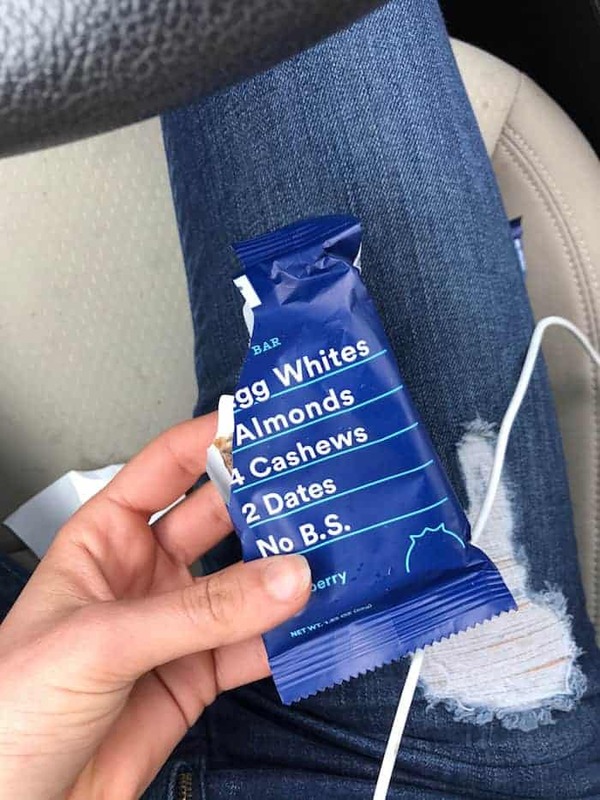 I work out about 4 days a week and end up scarfing down protein bars on the run more times than would be ideal but I have other priorities that aren’t food and exercise. Thanks for being so down to earth and a good example of being healthy when crazy busy! I love your make-ahead recipes! those toasts are so beautiful!! and i’m dyinggggg to read You Are a Badass, was literally in my boss’s office telling her about it just now! also really need to try that lentil pasta. i recently bought chickpea pasta from Eat Banza and that stuff is a game changer!! Oh my goodness, that galette looks incredible!! I totally want to try to make something like that at home now. A day filled with making and tasting toast sounds like a dream to me! I made my dad some fancy toast this past Sunday and he was like “Woah, I never knew toast could be so complex. There are actual waves of flavor!” I’m slowly turning my family as toast-obsessed as me haha ;) . Okay you sold me on Baconana. It sounds like TRISM is going to be such an awesome, positive thing in your life! The busyness is worth it! Keep doin your thing! Ok I need more mornings like the one you enjoyed here! That sounds amazing! Dang – I might need to make a trip to Ohio to check TRISM out. It’s going to be so awesome! those little toasts! im pretty sure i don’t like any of the spreads on them, but they just look so adorable i wanna try! Congrats on the opening!! The busyness is worth it! Keep doing your thing! I too need a great morning story like this. So want to be there. Lovely morning story it seems. Great share.